Synopsis, Our Opinion: A lively food friendly Grüner Veltliner. 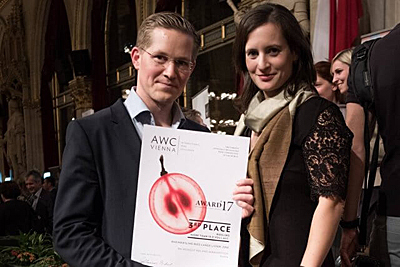 Producer/Winery: Martin and Blandine Minkowitsch; Roland Minkowitsch; Mannersdorf / March, Austria. Paired With: Venison enchiladas, Mexican rice, refried beans and cilantro leaves. Chilled before drinking. Clear, pale wheat straw color with a tint of green. Apple and honey suckle aromas with a small amount of petroleum in the background, especially as it warmed up. Smooth, off dry, slight creamy mouthfeel, medium body and a 400-grit texture. Flavors of strong ripe apple, slight lemon & lime citrus and hints of mango. Fresh crisp acidity that really gave it spark and a long slightly mineral-metallic tasting finish. An OUTSTANDING pairing with the venison enchiladas and good as a sipping wine too. We called it a lively food friendly Grüner Veltliner. Note: Next time we have this dinner we’re going to pair it with this wine and the Huber Grüner Veltliner and do a side-by-side tasting. 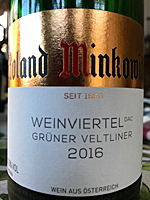 Comments: Learn more about Roland Minkowitsch and their wines.